Established in 2007, Helsinki based MultiTouch, is the world leading-developer of multi-touch displays which allow any number of users to operate the displays simultaneously. While the number of touchscreen users is growing exponentially, MultiTouch’s goal is to provide the most important solutions for large multi-touch systems. Besides its Helsinki office, MultiTouch has offices in New York, California, and Singapore, and its displays are used in more than 50 countries around the world. They are used in a range of markets such as retail business, advertising, exhibitions, museums, education and design. The products are sold directly and through MultiTouch’s global partner network. MultiTouch first came into being when a group of Finnish academics carried out research on user interfaces in public places. Their research resulted in the creation of the ‘City Wall’ installation in Finland’s capital, Helsinki, and is a great example of the simplicity of multi-touch displays and surface computing, and the collaborative and playful human engagement that it naturally leads to. A video showing ‘City Wall’ in use was posted to You Tube and has generated nearly 300,000 hits and numerous requests for further information from excited viewers. It was this enthusiasm about the fledgling MultiTouch technology that encouraged CEO Petri Martikainen and his colleagues to set up MultiTouch Ltd.
MultiTouch’s first commercial project was for Deutsche Telekom’s exhibit at CeBIT 2008. At 6 metres wide by 1.5 metres high, the display which comprised a series of projection-based screens was the largest at CeBIT and was built to attract and engage visitors in a social experience where any number of users could simultaneously gather information about products and services. MultiTouch adopted LCD technology in late 2008 when it was involved in the Bow Habitat Station in Calgary, Canada. Emphasising the importance of Alberta’s wetland, watersheds and water systems, Bow Habitat Station offers visitors live fish displays, and tours of the adjoining fish hatchery and wetlands. 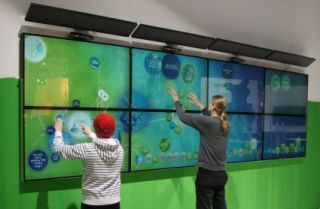 MultiTouch’s state-of-the-art table, in the shape of a 2.7 metre by 1.6 metre map of Alberta, was undoubtedly the most adventurous contribution to the station, giving visitors the opportunity to surround the entire table, simultaneously exploring layers of information about Alberta’s water in videos, animations, and text. At the same time, MultiTouch was also busy adapting its technology for a leading hotel chain in Norway, a Norwegian firm of architects, and a Swiss pen manufacturer’s flagship store. MultiTouch’s position as a world-leading developer of multi-touch technologies using LCD was confirmed when major brands Siemens and Lincoln used them to stunning effect. In collaboration with Austria-based IT developer uma, MultiTouch created what was at the time the world’s largest public multi-touch display at Siemens City in Vienna, Austria. Utilising 14 x 46” displays, the huge installation enables dozens of visitors to simultaneously interact with Siemens information, facility design and layout, as well as digital art, local and global news, audiovisuals, and other rich media and Web 2.0 content. At the 2010 Detroit, Chicago, and New York Auto shows, luxury car manufacturer Lincoln used a sleek 4 metre long MultiTouch table to engage people by presenting product marketing information in an original, visually compelling format. The display enabled Lincoln to highlight common technologies across its product line and accentuated the blend of luxury and innovation that embodies the Lincoln brand. This entertaining and intuitive multi-user interface enables users to control their own experience as they peruse the rich, interactive content. The displays created by MultiTouch today are known as ‘MultiTaction Cells’, and they can be seen in a wide range of applications around the world. Beauty brand Urban Retreat currently uses MultiTaction in its concession in Harrods, London. In a platform known as BeautyTouch, MultiTaction provides a 360 degree solution to interactive retail marketing for innovative brands looking to give their customers an exciting in-store experience every time. The platform focuses on using interactive technology to enhance the shopping experience for consumers, and provides previously inaccessible insight to brands on the behaviour of retail browsers using embedded data capture filters. By using gesture technology and Enriched Reality – MultiTouch’s own object recognition technology – BeautyTouch lets consumers dynamically browse, share, email, give feedback and request further information about on-screen content in real time, and in an environment that brings branded content to life. Other retail uses include the uma SKIN semantic system, which changes the face of retail by letting customers read specifications and see a virtual 3D view of products, while Atracsys’ ‘Chocolate Station’ enables customers to read ingredients, descriptions, and nutritional facts of various chocolates, and assemble a box of favourites. Besides retail, MultiTouch products are used extensively in hospitality. The display at Tokyo’s Graffiti Bar comprised 7 x 46” and 7 x 32” screens and enabled visitors to draw graffiti, browse menus, play games and enjoy media content. VIP members were issued with markers which, when placed on the display, trigger exclusive VIP content. More recently, a total of 48 ‘ultra-thin bezel’ MultiTaction Cells were used in the creation of an installation known as The Cube, at Queensland University of Technology in Brisbane. The Cube comprises 6 educational zones, including the two-storey, 14-metre-long Virtual Reef where 20 Cells ingeniously combine with an edge-blended projection system. The MultiTaction Cells used feature MultiTouch’s pioneering ultra-thin bezel which, when deployed in a stacked array, results in the narrowest possible seam between screens. You can read a case study of The Cube installation in the upcoming May/June edition of Signage Solutions. MultiTouch is working constantly at developing the technologies it uses to provide the best possible user experience of multi-touch. Hybrid Tracking, for example, works to ensure that MultiTaction Cells are immune from the effects of ambient light whether sunlight, halogen spotlights or other light sources, so that they work equally well in high streets or shopping malls. Likewise, the release of MultiTaction IR Pen software in June 2012 has enabled users to write, draw, sketch, and brainstorm designs and words on MultiTaction Cell displays using most IR pens. As an added advantage, the software can distinguish clearly between pen and touch interactions giving users the benefit of a combined digital whiteboard and multi-user interactive display, and providing a more effective presentation tool for corporate, educational, and media industry sectors. Another important development is MultiTaction Site Manager which enables system integrators, IT managers and content providers to manage thousands of globally dispersed, network connected interactive systems. Enabling faster and cheaper management and maintenance, the solution is ideal for the corporate, retail, digital signage and education industries. A major feature, which MultiTouch introduced for the Siemens and Lincoln installations, is unlimited stackability. Virtually any number of MultiTaction Cells can be assembled together to operate as one screen. This, coupled with the release of ultra-thin bezel MultiTaction Cells gives integrators the opportunity to create giant displays in any conceivable configuration, with near-indiscernible mullion. MultiTouch’s proprietary Enriched Reality technology is providing ever more diverse ways of using MultiTaction. Enriched Reality uses 2D optical tags which are attached to real-life objects so that the MultiTaction Cell can interact with those objects. For example, in one application, users can place plush Angry Birds toys on to the MultiTaction Cell and find out more information about each character. The creation of Enriched Reality has given rise to MultiTaction Codice, which debuted at DSE 2013. Codice allows users of digital signage and other interactive displays to send content directly to their email addresses just by using their personal Codice marker. An interactive display reads the 2D barcode to show, send and receive information resulting in a highly personalised digital signage experience. The Codice marker can be printed on any object such as cell phones, tickets, or loyalty program cards for a wide variety of applications. As MultiTouch continues to improve its existing hardware and firmware while introducing new products, the company also seeks to broaden the uptake of its technologies. Workspaces are another area where MultiTouch displays are being utilised to great effect. A good example is in the ‘Executive Brand Suite’ at a City of London firm where a huge interactive LCD wall was built using 24 MultiTouch displays. Further developments are expected to be announced this year, including the possibility of a new product launch at InfoComm 2013. MultiTouch will be at booth 4781 where it will be showcasing the 55" ultra-thin bezel MultiTaction Cell extensively with two wall setups: a 2x3 wall with MultiTaction Experience and 1x3 portrait wall with partner content.